Koussa, or zucchini squash, is a love of mine since my early childhood. One of my mom’s signature dishes was this amazing stuffed zucchini, and I do try to make it once in a while. 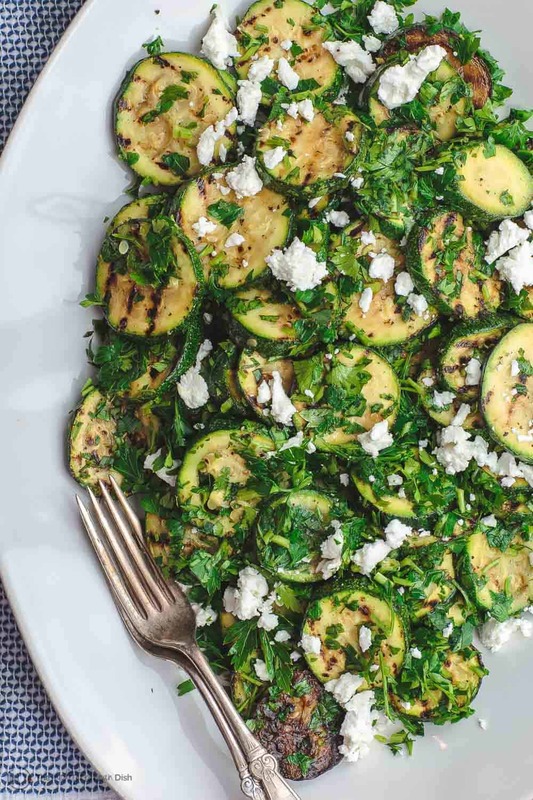 But, more often than not, I opt for a quick something like today’s Mediterranean-style grilled zucchini salad. Zucchini squash is one of those super good-for-you ingredients, but it has a bit of a reputation as being bland. When in doubt, totally throw your zucchini on the grill or an indoor griddle. 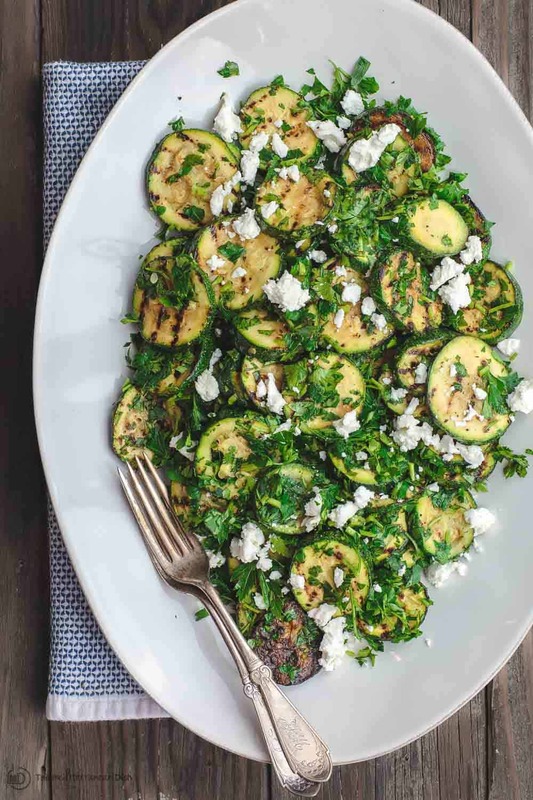 They’ll soften up and get nice and charred imparting great flavor with very little effort–essentially what we do here in this grilled zucchini salad. 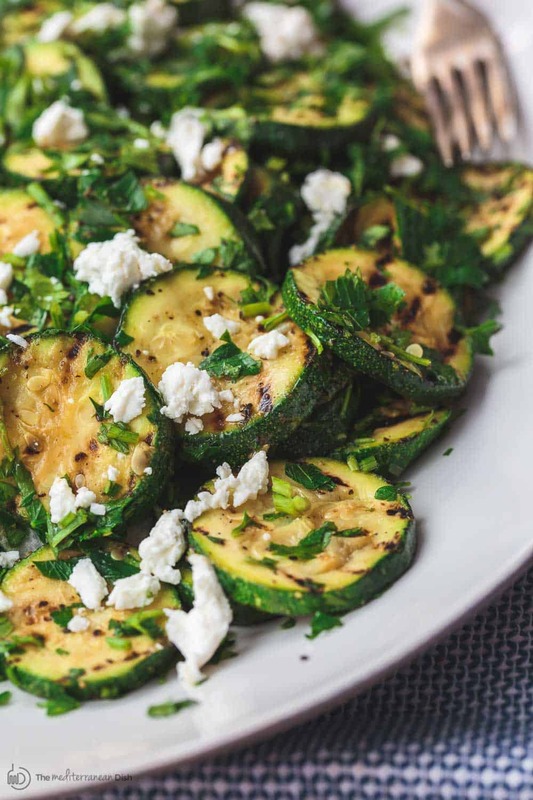 A little coating of great EVOO, lemon juice, cumin and fresh herbs, take a simple grilled zucchini to a show-stopping zucchini salad. This zucchini salad is great served room temperature, which makes it the perfect potluck dish to bring along. In the summer months, I love adding it as a side to this grilled Kofta or my Mediterranean grilled chicken & dill yogurt sauce. Or as part of mezze along with other small plates like Tzatziki, roasted garlic hummus and tabouli. 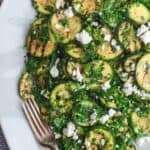 Easy Mediterranean-style grilled zucchini salad with fresh herbs, lemon juice, and a sprinkle of feta. Serve it at room temperature. Place the zucchini into a large bowl. Drizzle about 3 tbsp extra virgin olive oil, and sprinkle with cumin. Toss with your clean hands to combine. Heat a grill or griddle until hot, add zucchini in batches (do not crowd). Grill for 4 minutes or so, turning over a couple of times until zucchini are cooked through and perfectly charred. Transfer grilled zucchini back to the bowl. Add lemon juice, fresh garlic, salt and pepper. Toss to combine. Add fresh herbs and toss again gently. Transfer to a serving platter and top with a sprinkle of feta or goat cheese, if you like. Serve at room temperature. For suggestions, see “what to serve with this zucchini salad” section up in the post above. Recommended for this recipe: our Private Reserve Greek extra virgin olive oil (from organically grown and processed Koroneiki olives). And from our organic spice collection: ground cumin. SAVE! Try our Greek Olive Oil Bundle; Ultimate Mediterranean Spice Bundle, or create your own 6-pack or 3-pack from our all-natural or organic spice collections! Made this last night to go with a herb and butter grilled cod. Excellent. Wow! Who knew zucchini could be made so tasty. Husband loved it. I ran across this recipe because I needed to use up my zucchini and parsley. And my goodness, it amazingly good! I am recommending it to all of my cooking friends. I read a comment that suggested basil in place of tarragon, which had great results. This works with zucchini noodles, too, if you’re cooking on a stove like I had to! Seriously, such a good recipe. Thank you, Suzy! Sienna, thanks so much! I’m glad this recipe came in handy! The first several times I mentioned ‘new Mediterranean recipe’ or made a spice order, my husband was skeptical. But he has eaten every bite! Here in East Texas, he is smoking pulled pork all day for our supper. I can’t wait to mix yellow and zucchini from my garden in this salad for a fusion flair to the meal! Thanks for the great recipes! I saw another comment about using yellow squash so that’s what we did because it was on hand. Very easy and delicious recipe (and used indoor grill which made the process that much easier). Going to make this one for an upcoming brunch with friends! Awesome, Sharon! So glad to hear you enjoyed it! Made this last night with my wife. We mixed yellow squash in along with the zucchini. Quick, easy and delicious. We’ll be making this one again for sure. Awesome, Chris! I love the idea of adding yellow squash as well! I love zucchini and I can’t wait to make this. We need a little sunshine so I can grill! Can’t wait to have this for a lunch or side this spring/summer! I made this twice already and it’s sooo good! I used basil in place of tarragon. Will be a keeper! Awesome, Donna! love that you used basil!!! Zucchinis are the best 🙂 Thank you ! So simple and perfect for when the grill is already fired up! It finally feels like spring today—can’t wait to give this salad a try. I’m all for simple! Thanks, Liz!